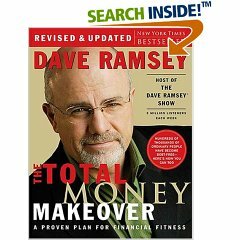 "The Total Money Makeover" is brilliant in its simplicity. This step-by-step guide leads you through all the decisions you need to make to get out of debt. Whether you have a few thousand on credit cards or you are worried about retirement, this book has all the basic answers and some sage advice to make you more secure and happy. Will this "Money Makeover" be easy? Dave Ramsey believes that anyone can get back on track with a little self-discipline and sacrifice. The stories in this book are amazing and some of the letters from people who tried the program are very encouraging. This book can be read in a few hours but the lessons it teaches will stay with you for life. This is the book to read if you want to avoid common scams and bad decisions. The Fascinating World of the Stock Market - Dow Jones Industrial Average, S&P 500 and NASDAQ. This section explains why the health of the market can be determined by a small sample of stocks. A list of the twelve golden rules of investing is also given to encourage confidence and wisdom. Investment Philosophies and Techniques - Detailed information on Mutual Funds and Hedge Funds. Performance History of US Equity Markets - Extremely detailed historical analysis complete with graphs and charts. 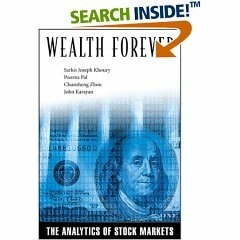 Every aspect of the stock market is covered in this book, complete with detailed analysis. This may be essential reading for any investor, whether or not they manage their own portfolio. Sarkis Joseph Khoury has lectured all over the world and shows his insight into a wide variety of financial and economic issues. He has also served as a consultant to major financial institutions and continues to lecture at many overseas universities. He is also the author of Conversations with the Conscience. Howard L. Russell is a professional loan broker who has been working in the trenches getting loans for his clients for years. He has also talked to thousands of people who didn’t qualify for a loan and finally realized no one had written a complete book on the subject. 7. Bankruptcy and what to do next. An alternative to bankruptcy. In the first chapter you learn exactly where to go to find your credit report. Web site info and phone numbers and how to get your report fast. In the back of the book, there are sample reports so you can read this book and see examples on the actual forms. Once you get your “own” report, that is when this book gets really helpful! What does ACCTS:18 mean? When you see this on your report it will mean you have 18 loans listed on your credit report. The author takes you step-by-step through your entire report! How unique to actually have someone spend that much time explaining things. Oh the beauty of books. There is no way the author could spend this much time in person because he would be out getting loans for his clients. So, this is really the “decoder” for your report. Although, I must say, he does do everything he can to help people get their credit back so they can get a loan the next time they apply. There are plenty of examples and stories that were quite interesting to read. There are some very important “warnings” listed. Like if a loan officer pulls a credit report and sees lots of recent inquiries, it might mean you are trying to borrow a lot of money in a short period of time or you have already been turned down a few times. You know, I don’t normally review “finance” type books, but this one is dang interesting! It is like entering this secret little world of loans. The font size is nice and easy on the eyes. This should be required reading at some time during high school! Everyone in America needs this information, because eventually you will need a loan. At that point it might be too late to undo the damage caused by mistakes you didn’t even know you made! "The earliest reports of payments with cowrie shells were from China about 3,500 years ago." The first thing I noticed on the first page was the heart-shaped English brass halfpenny token from 1665. I've seen a lot of coins, but had no idea that they could be in so many shapes. From the Ancient Chinese bronze hoe-shaped coin of the 6th century to the square Indian gold mohur of the 17th century, there is a coin for every taste and collection. 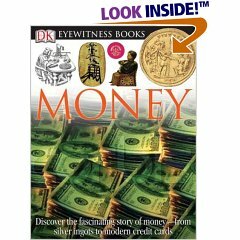 There is information on funny money, the first coins, paper money, how coins are made, how banknotes are made, forgery and fakes, money and trade, money in war, power, shared currencies, checks and plastic and coin collections. The countries features include ancient cultures, France, Germany, Netherlands, Belgium, Italy, Spain, Portugal, Greece, Turkey, Denmark, Norway, Sweden, Finland, United Kingdom, United States of America, Canada, Australia, New Zealand, China, Japan and African countries. "The name for a piggy bank comes from pygg, a type of clay used in Middle Ages to make pots for money and other thing. The idea to make banks in the shape of pigs probably came from the similarity of the words." be the strangest thing I've heard about money. This book has the most bizarre tales about money and also has a special section on coin collecting, how to store them and why you should note store them in a plastic envelope. It is truly amazing how humans went from stone money to transferring money directly into our checking accounts. This book reminded me of visiting a place in Africa where a man told me if I could lift a gold bar with one hand I could have the gold. I did try. There is a picture of the Federal Reserve Bank in New York where one-third of all the monetary gold in the world is found in special cages. "When one country sells gold to another, it is moved between the cages by workers wearing shoe covers to protect their feet from dropped bricks." The most fun you will ever have reading about money.